SHARE Pour a pint into this Shamrock Beer Mug and bring the luck of the Irish to your friends and family! 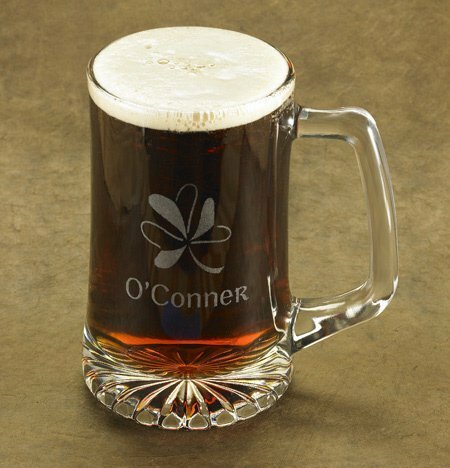 This mug is laser-etched with a contemporary shamrock design and is personalized with your recipient's name (up to 10 characters). The beer mug holds 25 ounces of their favorite liquid refreshment. Our top quality, heavyweight clear glass mug measures 3-3/4" by 6-3/4". Makes a great gift for almost any occasion. Note - This item includes a personalization, color, size or design option: Text Line 1 (e.g., First Name) (max of 10 characters) (Free of charge). You may specify this information during our checkout process.